From a world expert in risk and the bestselling author of The Tiger That Isn’t (and creator of BBC Radio 4’s More or Less), this is a commonsense (and wildly entertaining) guide to personal risk and decoding the statistics that represent it. First published by Profile Books in 2013. “A very funny book … this is one of those maths books that claims to be self-help, and on the evidence presented here, we are in dire need of it”. 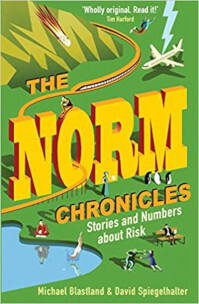 “The statistics are presented with admirable lucidity, using an ingenious method devised by the authors, and may serve to reassure more neurotic readers … Witty and illuminating, The Norm Chronicles is essential reading for anyone wanting to know whether they should try skydiving, or accept that third glass of wine”.